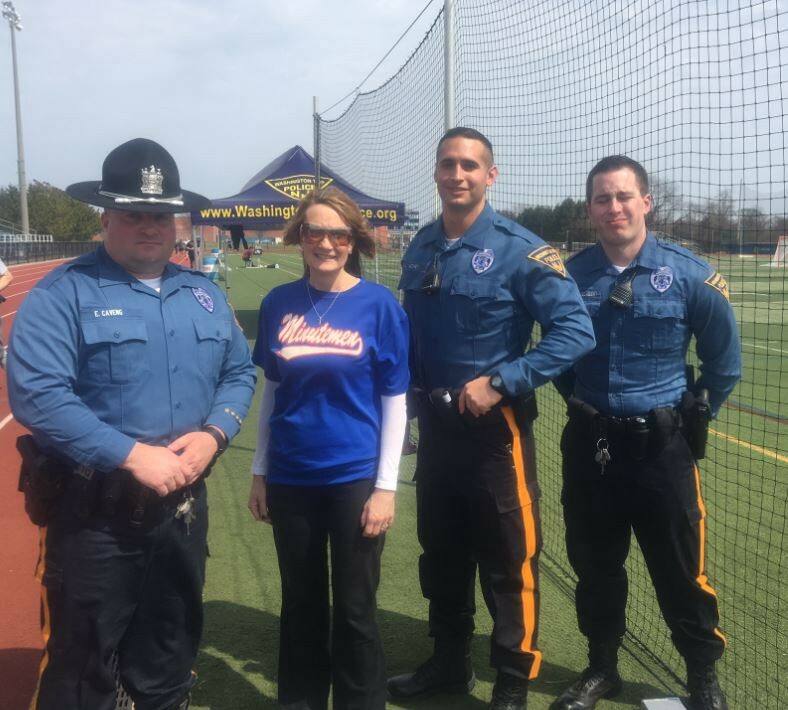 Pictured from left are Officer Eric Caveng, Mayor Joann Gattinelli, Officer Lawrence Achey and Officer Matthew Laudenslager at the recent police academy physical fitness test. I had the pleasure of attending the physical fitness tests for the Police Academy. There were more than 220 applicants registered for the physical test on March 25. I was happy to see so many individuals meet the Washington Township Police Department hiring standards who applied to take the test. This is an extremely competitive field, and some of the physical events included the maximum number of push-ups in one minute, maximum number of sit-ups in one minute, vertical jump, 300-meter run and the 1.5-mile run. The police department staffed this event with approximately 20 officers. This event gave me more insight into the testing process, and I am very proud of our police department’s dedication to excellence preparing these applicants in what it takes to be a police officer. 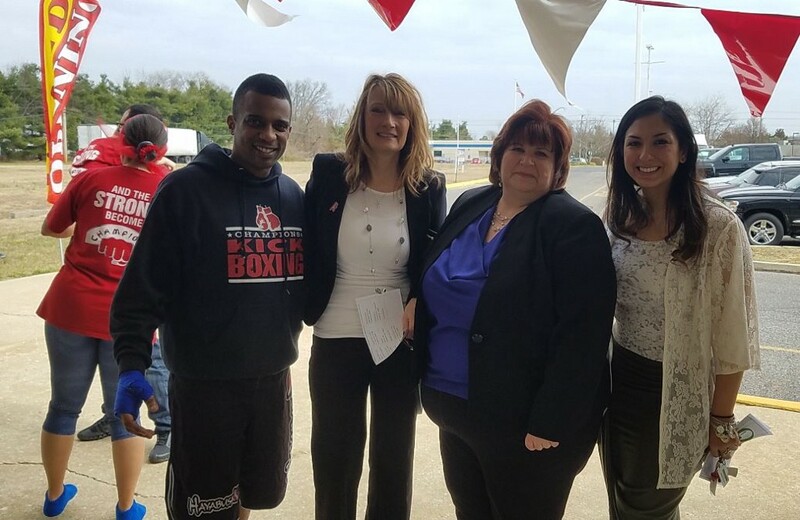 Sensei Preston Conyers (left) posed for a photo with Mayor Joann Gattinelli, Washington Township Chamber of Commerce President Maureen Pasternak, and Councilwoman Angela Donato at the grand opening for Champion Martial Arts. On the new business front, I attended the grand opening for Champions Martial Arts at 309 Fries Mill Road, Sewell. Sensei Preston Conyers was proudly introduced as the head instructor and co-owner of Champions Martial Arts. He has been training for 20 years in several martial arts disciplines, including Kenpo Karate, Tae Kwon Do and Brazilian Jiu Jitsu, among others. We are happy to continue welcoming new businesses to Washington Township, especially those that enrich the community. They offer preschool martial arts, kid martial arts, adult martial arts, adult fitness kickboxing and even host birthday parties. I have participated in kickboxing workouts and appreciate the experience these knowledgeable instructors create in their classes. We are proud to welcome new businesses such as this one to Washington Township. On Wednesday, March 29, I attended the Board of Education meeting where several awards were given for participation in the 2017 Super Bowl Hoagie Sale. I was honored to accept a plaque on behalf of Washington Township for the “Changing Our World Project” with Councilwoman Angela Donato. Several others were honored, including local businesses who went above and beyond, knowing the hoagie sale would support local families in need. Thank you to all who participated. I am happy to do anything I can to support those in need, and I am proud of the many people who give their time for community service. An initiative I am very happy that has been taking place for years now is the Mother’s Cupboard. They help families in need with food and essentials. On Saturday, March 25, Bottelli’s ShopRite hosted a Mother’s Cupboard event to collect canned goods from generous shoppers. I was happy to contribute a bag full of canned goods and would like to thank the many others who also contributed. On Saturday, April 8, there are two events that promote environmental consciousness in Washington Township. We have our Shred Day Event, free to Washington Township residents, from 9 a.m. to noon at the Municipal Building. Bring your paper shredding materials to the Municipal Building and 100 percent of the paper will be recycled. Please, no plastics or metals. We also have a Rain Barrel Workshop taking place in Washington Lake Park from 8 a.m. to 10 a.m. These rain barrels can help conserve water and keep your garden green. Workshop leaders will assist you in constructing your own 55-gallon rain barrel, and all materials are provided. The cost of the workshop is $20. I am happy with the many initiatives that are being taken to go green, and I am always in support of environmentally friendly activities.